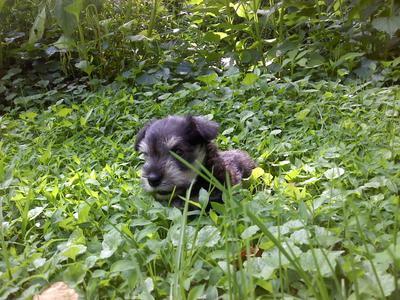 My miniature schnauzer Hope is definitely an eye catcher. Everyone comments on her and just has to talk to her. She is smart, adorable, and fun to love! Hope was born July 4th of 2012 in Piedmont, SC. I drove 45 miles to pick her up in the middle of the night. (I didn't want to take any chances missing out on such a love. The breeders were nice enough to adopt her out a 12 midnite). I found her on Craigslist. Hope was the last adopted out of 6 others, she is the runt. 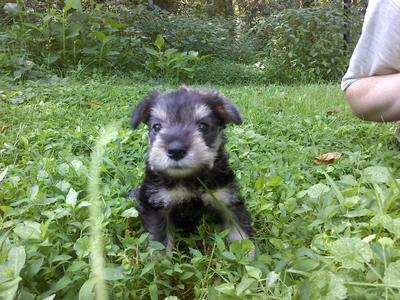 I named Hope... "Hope" because last Spring I sat 8 hours delivering the same breed miniature schnauzers all female! ..and had to tear the sacks of everyone and resuscitate two, one with a simple rub, The other by CPR this one of which I named Hope. Hope Sophia is my Joy and my Hope. Hope Sophia is very loved!